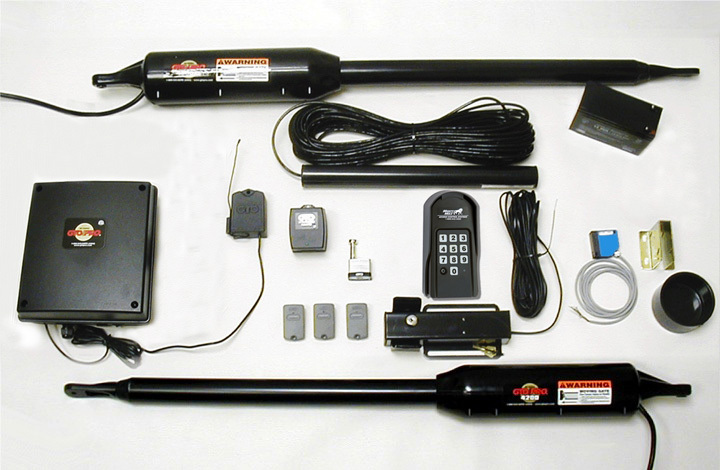 GTO/PRO SW4000XL /SW4200XL (FMSW4200) dual swing gate system. The GTO/PRO SW4000XL works as a "slave" automatic gate operator when installed with the GTO/PRO SW4000XL. The PRO SW4000XL will work on gates that are 3.5 ft. to 20 ft. in length, and weighing up to 1000 lb. The PRO SW4000XL wires into the "master" control box; the control board can be programmed for dual gate operation and the sequencing of the two gates. The PRO SW4000XL includes: operator arm w/ 50 ft. power cable, second operator wiring harness, mounting hardware, caution signs.